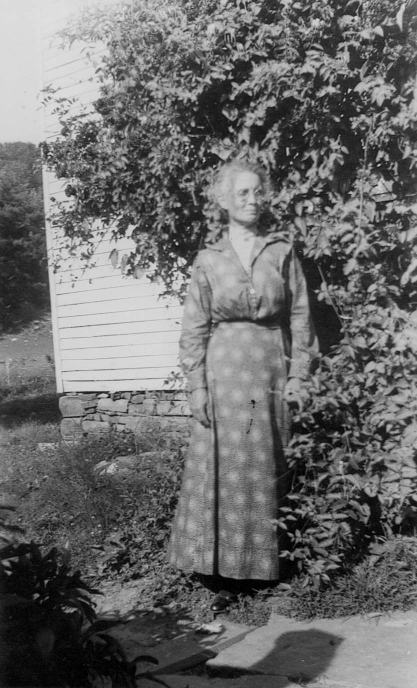 Conway Lea poses for a picture in her elderly years. My journal today will again feature Miss Conway Lea, and from the response I’ve had to my previous stories, I don’t believe it will bore anyone to read yet another chapter in this remarkable lady’s life, although this one is short. I was very happy to receive in the mail from Betty Sue (Ashburn) Ledbetter, formerly of Livingston and who now lives in Chattanooga, pictures of Miss Conway and her parents which are included in this entry of my journal. These pictures were taken at the Lea home near what was known as the Wash Lea cave just outside the city limits of Livingston on the Alpine highway. In another picture that was included but not shown here, the Lea home can be seen in the background, and it surprised me to see that it seems to have been very similar in size and shape of the one on East Cedar Street, a large two-story white framed home. I couldn’t help but wish it were still there today. Betty and her mother, Mrs. Pearl Ashburn, were regular visitors in the Wash and Belle Lea home when they lived near the Wash Lea cave, and also in the home the Lea family moved to on East Cedar Street as well. Pearl’s husband, Arthur Ashburn, was killed in a truck accident when Betty was only 5 months-old, and the telegram that came advising the Ashburn family of Mr. Ashburn’s death was sent to Miss Conway’s home on East Cedar Street. It was Miss Conway who had the misfortune of having to deliver the bad news about the death of Arthur Ashburn to his family in the Oak Grove Community, which is located between Livingston and Alpine. After her father’s death, Betty and her mother would spend at least one night a week in Miss Conway’s home. The furniture in the parlor of the Conway home was kept covered with newspapers and sheets, and Betty told me the bed she slept in had a mattress she remembers being made out of straw and feathers, and the bed itself sat very high off the floor. When it was bedtime at Miss Conway’s house, Betty’s mother would pull a chair up next to the bed so Betty could climb up on the chair and then onto the bed. In the winter months when she and Mrs. Ashburn would come for a visit with Miss Conway, after having supper, they would spend the time before retiring for the night sitting near the fireplace that was in the bedroom. A kerosene lamp provided the light they had. Betty told me before going to bed, she would help Miss Conway make sure the bantam chickens were “tucked in for the night”. Betty loved the big, old-fashioned kitchen in Miss Conway’s home, and she liked using the hand pump to get water from the well on the back porch. Miss Conway would sometimes take Betty out to the little garage building in the yard of her house so she could see the car she also kept covered with quilts. After they carefully uncovered the car, Betty was allowed to look at the car, but she was always reminded by Miss Conway not to touch it. Betty told me the weekly visits with Miss Conway were always a real adventure for her, something she looked forward to each time. I was also very happy to receive in the mail a letter from another former Overton County resident, Bettye J. (Barnes) Zaitzeff, who now lives in Campbell, CA, a small town located not too far from San Jose. Bettye also had some information to share with me about her friendship with Miss Conway. Part of her letter to me reads as follows, “My mother and I visited Miss Conway there (East Cedar Street home), but I also remember the old house in the cove on the way to Oak Grove, near the cave where we went on picnics. That is where I remember the bantams, and where she may have saved my life. “I was running down a little hill while I was eating an apple she had given me. When I got choked, my mother was in a panic because I was turning blue. Miss Conway picked me up by the heels, gave me a good whack on the back, and dislodged the piece of apple. That was probably around 1932 or so. “Probably another year or so later, my family was in town for the Fourth of July activities when we saw Miss Conway parked on the square in her black shiny car. I remember looking at my reflection in the fender and rubbing it gently with my hand to remove a speck of dust. Miss Conway asked my mother to tell me to stop because she was afraid I’d mar the surface. The things I remember about the East Cedar house were the paintings and the hanging biscuits. Hopefully this won’t be the last story that turns up about Miss Conway. She has been a very inspiring person to write about and should there be other stories someone else has to share with me, I will surely pass them along. 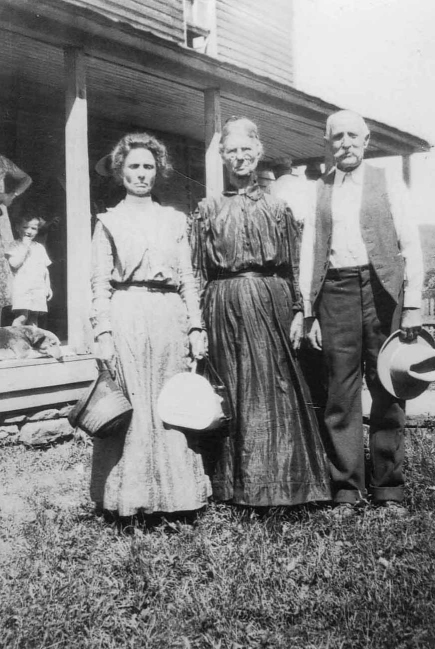 Conway Lea, and her parents, Mr. and Mrs. Wash Lea, are photographed in 1932 in front of their home, which was located just outside the city limits toward Alpine.